Cripes, Suzette! : Let's Go Shopping! I recognize that I am standing on the precipice and about to fall off. After years of minimizing and insisting on carrying small, I am ready to boomerang over to the farthest extreme. I am currently preoccupied with acquiring handbags. Handbags I don't need. Big, gaudy handbags. I have not acted yet, but I feel like I could make my move at any moment. 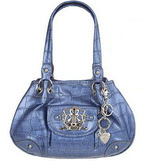 The other day, one of my co-workers showed me her giant blue fake-croc satchel which is not my style at all. It's kind of iridescent and sometimes it looks purplish and it has shiny charms dangling off of it and its only one click away on QVC.com. I can't stop thinking that I need one, too. NEED one. In other Women's Accessory News, it looks like I will be returning to Scottsdale for business around Thanksgiving time. Finger's crossed that this trip is confirmed because then I will have an opportunity to go back to that nice little gift shop and replace the tooled leather cosmetic case which the TSA stole from me earlier this year. Then balance will be restored to the world. Crime pays. Not for the criminal but for the jurors. Especially if it's a federal case, which cashes out at $40.00 a day and 48.5c a mile. For my three days' service, that puts me at a sweet $240.54. In my case, my employer continues paying me my regular salary so the jury money is all profit*. At the end of it all, I came away with a very positive impression of the U.S. judicial process, detailed knowledge about Llama 9mmm semi-automatic handguns and a firm resolve to stay far, far away from the White Castle on Elizabeth Avenue in Newark. The judge was fabulous and gave us an opportunity after the trail to come back inside and ask any questions we wanted to. We got a big earful of background information that we couldn't hear earlier and it confirmed for us that we had made the right decision. Also, I got to look at a nice parade of dishy policemen, who - when they aren't writing out speeding tickets with your name on them - are not half bad to look at. Today I have $240.54 burning a hole in my pocket and I'm running out of room on the scratch pad I'm using to list the possibilities. *I ignore the cost of the gas, which Sami always fills for me out of his pocket money, and wear and tear on the car, because I'd be driving someplace anyway. So when you think like I do, it's all profit. Don't think that because none of you have responded to my tantalizing posts about plane spotting that you have heard the last of it. In fact, we at Cripes, Suzette! are going public and admitting right out loud that we are now on a mission to bore anyone who remains stationary for longer than 3 minutes about sitting on the deck watching planes go by. Binoculars! The very universe - let alone the internet - have conspired to make this happen. An unexpected bonus landed upon me this week, 60 bucks of which went to these. Native guilt will never let me do anything special with bonus money, even if my intention is to do something wholesome and worthwhile like replacing the area rugs ruined by a sick old dog, I just cannot let myself do it. But 60 bucks on a luxury item, that I can manage. It is a blessing to know one's self. Reference book. Lord luv Abe Books. Who wouldn't be willing to spend a dollar to have their own copy of A Field Guide to Airplanes of North America? "The format of "A Field Guide to Airplanes" will be familiar to birdwatchers, as the authors have taken the style of Peterson's famous identification guides and applied it to aircraft." What's not to love? Reader reviews indicate this is perfect for 8 year olds and beginner air traffic controllers. I got the 1996 2nd edition not the updated 2006 aversion, because its the older planes that go in and out of Liberty International. Also, potential for future upgrades. If you are not interested in my plane spotting activities (see? My little past time has a name now. That's the final sign of true of obsession) there is more news of days gone by. I am currently possessed with letting everyone know that this_is_how_we_do_it. Younger, hipper female relatives have informed me that I am 12 or so years behind the times, but whatevs. All hands are in the air. Meanwhile, back to the point: VIDEO UPDATE - Superjumbo Airbus A380 landing in Hong Kong this week. This is what I'm SAYIN'. Tell me you weren't watching that with your mouth hanging open. I didn't think my life could get any better but a pair of Shure earbuds proved me wrong. My cheap little mp3 player was hypnotic enough but I made an investment in some E2s and whoa baby! my life is fulfilled. My original plan here was to load up the internet air waves with jabber about my fabulous new Crest SpinBrush, which is very much superior to my old Oral B Cross Action battery operated toothbrush, but frankly my dental appliances are no match, glamor-wise or fascination-wise, to the earbuds. Tonight I was sitting on the deck working my way through my modest little music catalog and by the time I got up to the Kinks doing "Apeman" , I realized that I had forgotten about my nightly plane-spotting. So I looked up and I saw a bat. I'd say more about how pleased I am with these earbuds but the next song in the queue is Tito Puente's "Don't You Worry 'Bout A Thing" and I've got to go. UPDATE: Morning has dawned and I'm able to report that it was with a begrudged attitude, but I was able to disconnect myself in order to sleep. I love these things, even though I perceive an element of danger in using these. They are not earbuds at all, but actually IN-EAR CANALPHONES. Does it not make you shudder? I worry that something will be left behind in there when I take them out. It's happened to me before, remember. The cottony blob from the end of a dollar-store imitation Q-Tip got stuck in my ear and I foolishly sought out the help of my then Employee Health Service. Their wothehell attitude when they tried to flush it out only served to jam it deeper. I walked around for 6 days like that until my HMO doc was able to see me to extract it with an instrument that looked more obstetrical than otolaryngical. The thing that makes these E2s so good is that you can customize the fit by changing the removable covers, which means they could come off. So its a risk but I don't care. Looks fancy - Not just fancy, but downright hip. These glasses give the impression that you know something that someone else doesn't and that right there is worth the price to me. More stable when you are holding your wine glass and waving your hands around for emphasis - Not a problem for you? Keep drinking - you'll be waving your hands around before you know it. Less likely to get knocked over once it is back down on the table - These glasses are also known as "tumblers" which is a comforting image to have in case they do get knocked over - say, when you are waving your hands around. Think inflatable clown bopping bag. 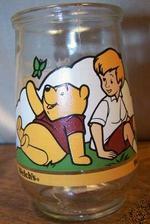 Family members will not use this glass for milk or soda - This is not my first experience with stemless wine drinking. I went through a Paisano phase some years ago and the container of choice was a thick-walled peasant glass, sometimes a tall one in case I wanted to add some seltzer. You could tumble those all day and all night without a care. Good times! Holds a lot of wine - Save yourself some steps at the end of a long workday by tanking up right off the bat. Battle cry: "Consume mass quantities!" Distracting fingerprints - This is a problem especially if you are doing hors' doerves. Not just fingerprints but big greasy smears. Hey, do we have any of those deviled eggs left? Hard to hold onto - They are quite bulbous. Imagine gripping a grapefruit and that is pretty much the degree of grip needed. Easy to do at the beginning of the evening but after a while, the hand fatigues. Pair this with the hand waving and you've got yourself a real situation. Takes up a lot of table space. Be careful when you put this down between the cheese platter and the crudities. You can utilize the air space over the base of the stemmed glassware but not with these - in fact, you need a bigger space than the base of the stemless glass to accommodate the swollen girth of this thing. Danger of pouring out too big a serving - In the same way that my "one cup of coffee a day" invoves a 24oz. travel mug from DD, "two glasses of wine" in these can be something of a problem unless your intention is to remain firmly planted in your deckchair for an extended period. So there we have it. 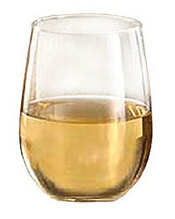 Stemless wine glasses: hipster trend or homage to the jelly glass? You decide.